Clody Lodge, Bunclody, Co. Wexford, Ireland. 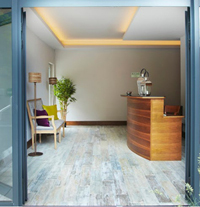 Newly established Clody Lodge provides boutique hotel style accommodation right in the heart of Bunclody town Co. Wexford. Stylish, comfortable and affordable. 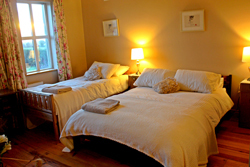 Clody Lodge boasts of ten whisper quiet bedrooms, all with king size bed and single bed. 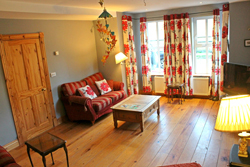 Private en-suite, free Wi-Fi and satellite TV, as well as complimentary in room tea and coffee. The facade overlooks Bunclody’s many picturesque shops, pubs and restaurants. To the rear of Clody Lodge is a private courtyard and steps to the tranquil streams and woodlands of the prestigious Bunclody Golf and Fishing Club. Free on street parking. There are coffee shops and restaurants within walking distance providing breakfast, lunch and evening meals. Bunclody Golf and Fishing Club is a scenic stroll away, just the right distance to work up an appetite for some wholesome food. There is a choice of local hostelries, all within walking distance and some providing live entertainment. Clody Lodge is centrally located within 5-10 min drive from the pretty and award winning villages of Kildavin and Clonegal also the end of the Wicklow Way where transport can be pre-arranged when booking. Clody Lodge is situated within 500 metres of the South Leinster Way which creates the ideal stay over for people completing both Wicklow Way and South Leinster Way or for the experienced walker doing both. We are also within 5 minutes’ walk to the local bus stop, within easy reach of the towns of Enniscorthy, Gorey, Carlow and Wexford and on a little further the cities of Kilkenny, Waterford and Dublin. A stay at Clody Lodge means a stay in one of the prime regions along Ireland's Ancient East route with a wealth of options. Treat yourself to a golfing weekend at the top of the range Bunclody Golf and Fishing Club. Local historical sites like the renowned Clonegal Castle, Newtownbarry House and Gardens or stroll or pedal the many beautiful and varied trails the adjoining Mount Leinster has to offer. The choice is yours - the stay fantastic. Our budget conscious accommodation options and packages are a sure way to relish your break away in Bunclody. Millview House Farmhouse B & B, Bunclody, Co. Wexford, Ireland. We are situated 1 hour and 20 mins south of Dublin in beautiful countryside on the border between counties Carlow and Wexford. The ferry port of Rosslare is only 55 mins away. There are daily bus connections to Dublin and Waterford ten-minutes walk from the house. Beautiful landscapes surround the house for walking tours; the Wicklow Way is just 5km away starting in Clonegal. Bunclody Golf and Fishing Club is within a ten-minute walk. For a more relaxed outing, several nearby hotels have excellent spas. Newtownbarry House is fifteen minutes walk away which has beautiful gardens, a tea room and art gallery. In nearby Clonegal, there is the wonderful Huntington Castle and gardens. Counties Wexford and Carlow have numerous gardens and historic houses open to the public. Millview House has been home to the Breen family for three generations. The current owners, James and Liz Breen, have restored the house to offer brightly decorated double and family rooms with relaxing views of the gardens and surrounding countryside. All have shower rooms ensuite. 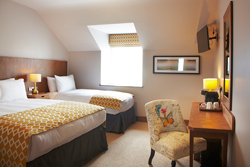 Two of our double rooms are at ground floor level. Email enquiries will receive a reply on the same day in most cases. Our postal address is Millview House, Bunclody, Enniscorthy, County Wexford, Ireland. 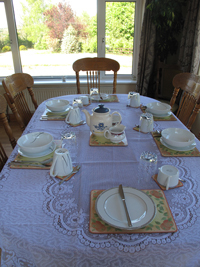 Samaya House Bed & Breakfast, Ardattin, Co. Carlow, Ireland. Samaya House is situated approximately 2 miles from the end of the Wicklow Way, near the picturesque village of Clonegal. 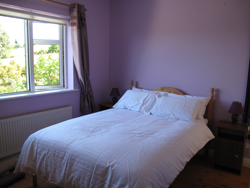 We provide affordable accommodation for hikers walking the Wicklow Way, cyclists and visitors following the Ancient East Trail or for anyone wanting to get away from the hustle and bustle of everyday life. Lifts are also available from Clonegal if you don’t have transport. You can relax and unwind at Samaya House after your long journey. Looking forward to having you stay. This is a family home situated three miles outside of Clonegal village which has many beautiful attractions such as Huntington Castle and the village is the final stage of the Wicklow Way. The house is a short distance to Mount Wolseley Hotel and Golf Course as well as Rathwood Garden Centre. Bunclody town is also close by. It is easily accessed from the M9 Exit 5. Lifts to and from Clonegal as part of the Wicklow Way can be arranged and from bus stops in Tullow and Bunclody. We offer 3 ensuite double bedrooms to our guests with access to a common TV room and spacious gardens for children to play. Parking is available. Continental breakfast is available every morning in a private dinning room. We are animal friendly and have pets.